As the former head of the UK Defence Intelligence Staff s nuclear, biological and chemical section, Brian Jones was ideally placed to pronounce upon the way in which Britain was taken to war and the way in which the intelligence reporting on Iraq's weapons of mass destruction (WMD) was manipulated to justify Saddam Hussein's removal from power. Jones calls on his own experience and knowledge, a variety of leaked documents, and the expert testimony given to a series of inquiries, including Chilcot, to examine how and why Tony Blair and George W. Bush, managed to deceive their legislatures and their electorates into believing that Iraqi WMD was a real threat that could attack the West within 45 minutes. He describes how Blair and Bush sought to use subsequent inquiries to cover up their own culpability in the deception, in order to facilitate re-election and keep their jobs. 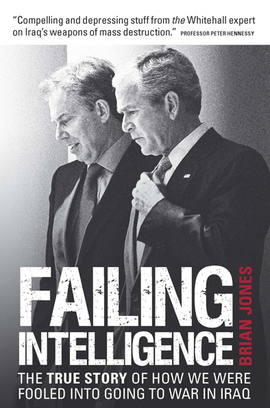 In conclusion, Jones pulls together the lessons that should have been learned in relation to both the use of intelligence to justify policy-making and with regard to broader international issues of security and governance.